In our family, we call juice “baby crack.” Its addictive, tasty and we’ve been led to think its healthy. There are some incredibly clever folks in the world of marketing who have both adults and kids alike convinced that juice is a health food. Not so! Today, I sat with a neighbor as we took the train into work. 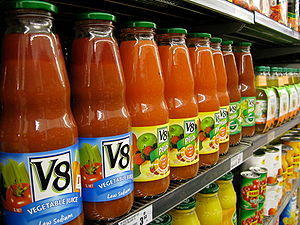 He proudly showed me his gigantic bottle of V8 juice, which he planned to drink throughout the day. Recalling my mother’s words, “if you can’t say anything nice, don’t say anything at all,” I managed to stumble over, “that sure is an impressive bottle of juice!” Totally awkward on my part, but I was reluctant to dole out unsolicited advice. However during our train ride, my neighbor initiated a conversation about nutrition and asked for my opinion. I was able to explain that while juice is healthy, relative to drinking soda all day, there are still downsides. For one thing, we know that people who drink juice will often drink it in addition to their food calories, not as a replacement for some of those calories. This leads to weight gain. Another downside to juice, even the fresh squeezed variety, is that it won’t give you the same amount of fiber as you get from eating the actual fruit or vegetable in its original form. 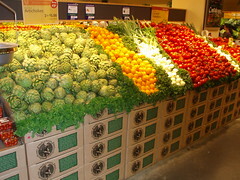 The fiber found in most fruits and vegetables can be very filling, leaving you less hungry over the next few hours. For example, if you eat a couple of oranges, you’ll likely feel pretty satisfied. That’s the fiber filling up your belly with healthy calories and nutrients. Now instead, squeeze the juice from two oranges into a glass and you’ll feel far less satiated, still able to eat a full portion of food with your next meal. Many juices and “fruit drinks” are loaded with sugar, artificial flavors or sweeteners that are completely devoid of nutritional value. Soda is even worse. Many people are surprised to learn that in addition to full calorie soda, “diet soda” has been highly correlated with obesity. Adults too, should drink more water. I’m never a fan of drinking one’s calories. Stick to water or perhaps an occasional glass of wine with dinner, but there’s no place in a healthy diet for soda or energy drinks. Syrupy cocktails and beer can pack on the pounds pretty effectively too. With summer here, avoid cooling off with soda, juices or alcohol. When you do indulge, be sure you’re alternating plain old water with your treat and be sure to skip dessert if you choose to drink your calories. Its always about finding the right trade off for you at the moment.